Flashback: When Phones Had Cords, Wagner Union, ca. 1999? These once-ubiquitous contraptions have become an endangered species. New Yorkers were searching for pay phones again, however, in the wake of Hurricane Sandy, when many people's cell phone service went down. 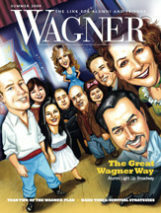 Share your memories of pay phones, or of the (to us) unknown person in this picture, by contacting Wagner Magazine. Thanks to Barbara Bellesi ’99, our mystery caller was identified as Jedediah “A. J.” Bila ’00. Perhaps she was making one of the last calls ever placed on those now practically extinct pay phones. Someone who devoted many years to their care was Kurt Schroder M’69, a retiree of the New York Telephone Company. 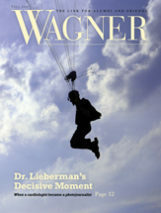 “I installed and repaired many pay phones in Brooklyn and Staten Island,” he wrote, “as well as land line phones, which worked during electrical outages!” He never serviced the phones at Wagner College, but he did spend a few summers inspecting the many phone booths along the Coney Island Boardwalk and repairing those jammed by sticky, sandy coins.